To equip leaders, find solutions and change the conversation about poverty in Canada, the Canadian Poverty Institute offers a number of ways to study poverty at Ambrose University in Calgary, Alberta. This unique learning opportunity brings students, practitioners and ministry workers together with leading experts in poverty reduction from across North America. Offered annually in June, this program includes a range of one-week intensive courses for credit or professional development. Over a 3 week period you will engage in active learning about the causes and impacts of poverty and best practices in poverty reduction. 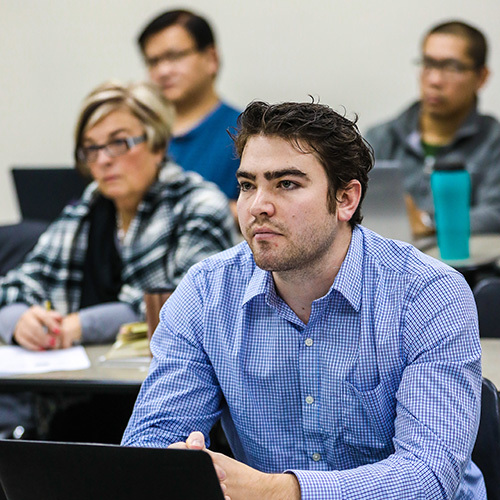 The interdisciplinary undergraduate minor provides students with an introduction to the nature, causes and consequences of poverty and the ways in which business, social and economic policy address both. Deepen your understanding of poverty as part of the MA in Leadership and Ministry (MALM) program at Ambrose. The Poverty Studies concentration equips students with the appropriate skills, knowledge and disposition to work effectively with people experiencing poverty and to advocate for justice through their ministries.